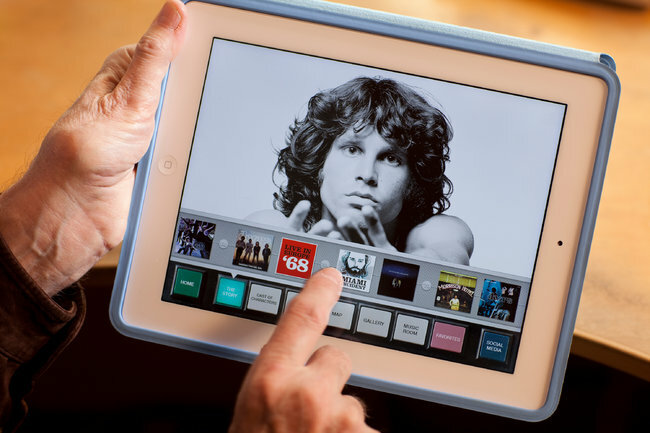 A new iPad app chronicling the rock legends the Doors has all the bells and whistles you would expect of electronic entertainment in 2013: immersive multimedia, cloud integration with iTunes, a ready connection to Facebook. The driving force behind it, however, is no 20-something Silicon Valley consultant. It is the 81-year-old Jac Holzman, who started Elektra Records as a teenager in 1950 and remains one of the music industry’s most passionate and punctilious tech nuts. For more than a year of seven-day weeks — on weekends at the office, he keeps Turner Classic Movies on mute, “so I don’t feel lonely” — Mr. Holzman has labored over the app with a small team, viewing it as a test for how record companies can market their catalogs digitally, now that sales of lushly designed, holiday-ready boxed sets have plunged. The app, which went on sale on Monday for $4.99, resembles a digital coffee table book, with video interviews, written contributions from figures like Francis Ford Coppola and Patti Smith, and appendices too big for any stocking stuffer, like 30 pages of transcripts from Jim Morrison’s indecent-exposure trial in 1970. Snippets of Doors songs point customers to Apple’s iTunes store, where remastered versions of the band’s albums, released by the Warner Music Group’s Rhino label, will also go on sale this week. The company will need to sell about 40,000 copies of the app to recoup its costs. Elektra played a primary role in the folk revival with acts like Josh White, Theodore Bikel and Judy Collins. But by the mid-’60s, with the New York scene “picked over” by rival labels, Mr. Holzman said, he began looking to Los Angeles and rock. He signed the Doors in 1966 with a $5,000 advance and a promise to release three albums. The Doors’ success ushered in a wave of rock signings at Elektra, from cult heroes like the Stooges and the MC5 to Queen. In 1973 Mr. Holzman left the label to become the chief technologist at Warner Communications, a somewhat-less-than-full-time gig that he completed while living in Hawaii — halfway, he noted, between Japan and the emergent Silicon Valley. A demonstration of the laser disc in 1971 got him excited for a future of digitized media, and speaking now, he criticizes the major labels’ response to the arrival of online music with a candor rare among the industry’s old guard. In 2004, after an investor consortium led by Edgar M. Bronfman Jr. bought the Warner group for $2.6 billion, Mr. Holzman — who had had intermittent involvement with the company since the mid-1980s — e-mailed Mr. Bronfman with an unsolicited critique of the business. They met, and Mr. Bronfman invited him back to run a digital-only label, Cordless, and redesign the company’s antiquated royalty accounting system. Dressed in a well-worn dark turtleneck, white sneakers and yanked-up white socks, Mr. Holzman eagerly showed off the documentary details of the app, including exhaustive visual inventories of the band’s recording equipment and a Doors-era map of Hollywood annotated down to Morrison’s favorite liquor store. One of the few apps with comparable depth is Blue Note Records’ Spotify app, a sortable, fine-grain guide to decades of jazz. Mr. Holzman declined to comment about that omission from the app’s otherwise thorough history of the band. Instead he spoke enthusiastically about the fiber-optic cable connection at his home office in Santa Monica, Calif., which he uses for high-quality interviews by phone, and why he never wants to retire fully.